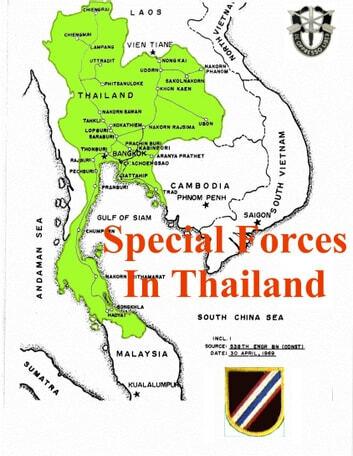 This is a history of 46th Special Forces Company (Airborne) that operated in the Kingdom of Thailand during the Vietnam War from 1966 to 1974. Many diversified missions have been levied upon the Green Berets, with the emphasis placed on counterinsurgency training. 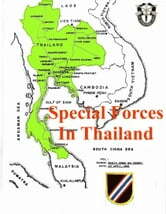 Initially, Green Berets were tasked with training selected infantry units of The Royal Thai Army prior to their deployment to Northeastern and Southern Thailand. Close co-ordination with Thai armed forces in formulating training programs, to include counterinsurgency and staff training for the royal Thai Marine Corps, battalion and company level training for The Royal Thai Army, specialized courses for The Royal Thai Army Special Forces and airborne battalion personnel, ranger training and border patrol police courses were areas affected. During 1967, selected Green Berets provided The Royal Thai Army Volunteer Regiment (Queen’s Cobras) with training in preparation for deployment to the Republic of Vietnam.